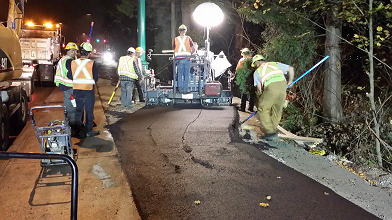 The approved Causeway sidewalk safety widening commenced in September, with nightly works between 9:30pm and 6:00am, and a target end date of December 20 (weather permitting). The larger impact is on the east side of the Causeway, and allows for uni-directional cyclist and bi-directional pedestrian traffic. 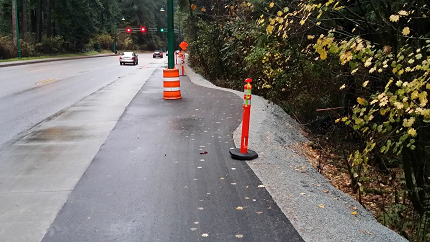 The existing concrete sidewalks are sawcut to abut newly laid asphalt extensions. A bike fence to separate vehicle and cycle traffic will be installed towards the end of November and is under production. Numerous extra widenings veer around lamp standards. As indicated in the approved expansion plan, fourteen young to mid-year trees have been removed by Park Board. At this point a couple more trees have been removed where leanings and/or destabilized roots were deemed to be of imminent safety concerns to human traffic. Low grade slopes have been prepped to receive applicable soils and approved seed mixes. Deeper drops have required construction of block retaining walls. Note the snow fence used to temporarily separate pedestrians and works from deep fills and drop walls as well as provide a safety barrier/protection around trees. 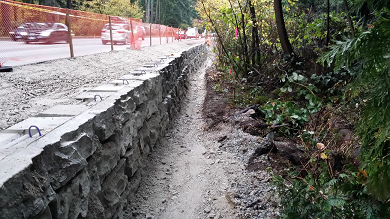 Where slopes are higher than the path, root barriers are being installed to mitigate future impacts to the sidewalk. 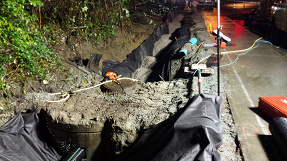 To accommodate widening, existing culverts have been extended. For sub-surface drainage, new HDPE sub-drains, cleanouts, drain basins have been installed, tying into the pre-existing storm drainage system. Tarps protect slopes from erosion until new soils and plantings are installed. The B.C. Ministry of Transportation & Infrastructure is responsible for this project. Vancouver Park Board oversees the project from the Park’s priorities and perspectives. Stanley Park Ecology Society is a stakeholder.